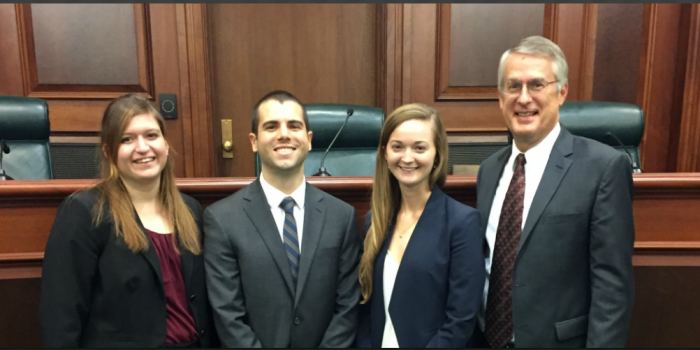 Kelsey Mellan (JD ’18), Alex Teixeira (JD ’18), Emily Lagan (JD ’18) and Professor John Korzen (JD '91) pose after securing a spot for the national competition at the Regional Moot Court Competition in November. Wake Forest School of Law’s Moot Court is ranked 12th among the best moot court programs in the nation by preLaw Magazine. The magazine ranked the top 100 law school moot court programs in its Fall 2017 issue (“Best schools for moot court,” page 8). Wake Forest, which won the National Moot Court Competition earlier this year, is the only North Carolina law school to make the list. Wake Forest’s National Moot Court Team, coached by Professor John Korzen (JD ’91), won all five of its oral arguments, tied for the second best brief and finished as the runner-up at the Region IV tournament held on Nov. 17 -18 in Richmond, Virginia. It is the fifth straight year that Wake Forest School of Law has reached the national finals in the National Moot Court Competition, which is the oldest moot court competition in the country and now in its 68th year. The current team is preparing for the National Moot Court Competition finals in January in New York after its success at the regional finals. The team will attend the finals as one of the best 30 teams in the country out of more than 180 that entered the competition. Only the two finalists from each region advance to the national finals.